If you're a bride-to-be, there's a good chance you're skipping dessert more often than not. After all, you do have a wedding dress to fit into and every calorie counts. But when you're counting calories, are you counting your wedding invitations? The all-knowing they once said it is three calories per envelope, although I've actually heard it's up to seventeen. Seal 100 envelopes and you're looking at 300 calories. I'd rather have three 100 calorie packs of Oreos. So what can you do to seal your envelopes and still have cookies? For people who are casual envelope users (sending a bill here and a birthday card there), your go to move is to lick the envelope. And that's fine for one or two. But if you're closing envelopes that number over, say, three, you need to employ a different method. 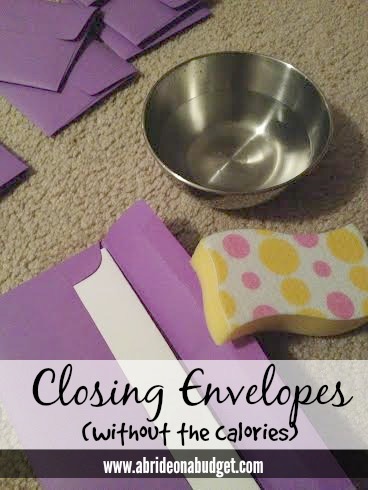 Sealing envelopes with a sponge is super easy, although I would advice that you test it out on one before you actually go to your wedding envelopes. You want to use a brand new, straight out of the package sponge. That way, you won't have to worry about any sort of food or counter particles getting inside your envelopes. Dip the corner of the sponge slightly in a bowl of water and, as even-handedly as possible, wipe the tip across the envelope. Close. Repeat on a second envelope. After two, you're gonna wanna dunk again. If you have excess water and you are able to seal a third one, it means your first envelope probably received too much water and it will get lumpy. If you look at the envelope on the bottom of that photo, you'll see what I mean about it being lumpy. It will dry pretty smooth but not completely smooth. The steadier you can keep your hand and the drier you can keep the sponge, the less the chance of this happening is. If you don't care and the lumps don't bother you, that's awesome. If you're a perfectionist like me and you sweat every single detail, then you are going to care. That's why I said practice first. See how much pressure you can (or can't apply) and how it will dry. 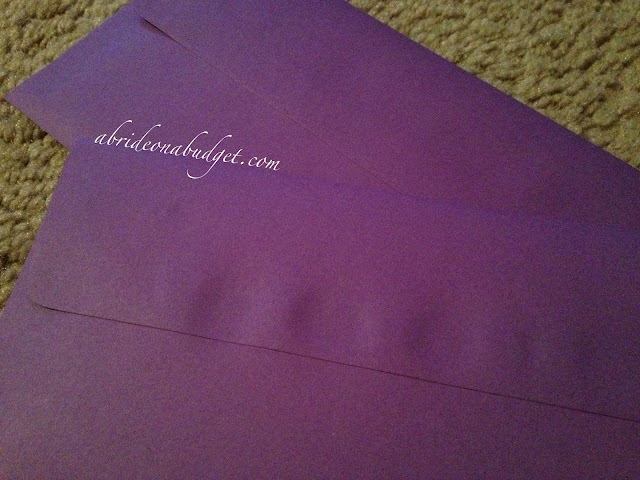 BRIDAL BABBLE: Have you used this method when you are closing envelopes?